Those of you who know me and my brother ( Tarun ) personally may know that my father hasn't been well for the last three years. He has been fighting with liver cirrhosis and we have been roaming around hospitals from past three years spent around 12 lakhs by selling whatever gold and small amount we have saved. 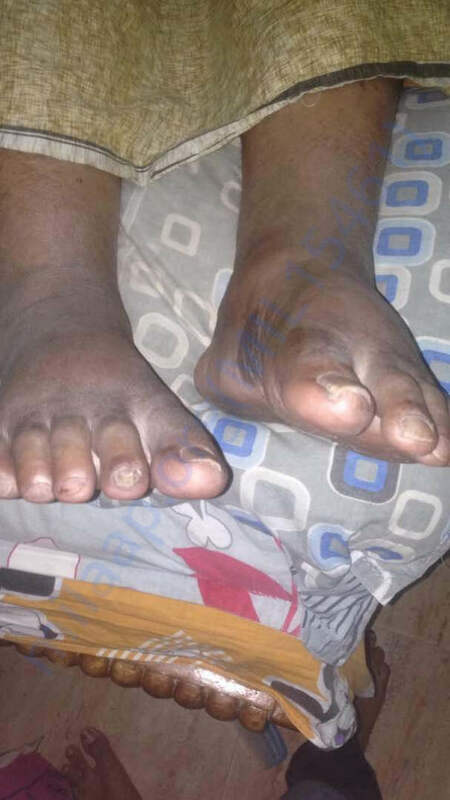 In this period of time, he has become extremely weak, lost his weight completely, forming EDIMA on his foot and ASCITES has got formed in his stomach.He got treated in apollo a year back when he suffered from blood vomiting,with 12 packets of blood transmission.with all the prayers we saved him because of CM relieve fund from state government that we got as we are white ration card holders ( Economically backward). But things got changed entirely from past one year where my father got admitted into hospital six times in the last five months. We have used every single way available like insurance and CM relieve fund. 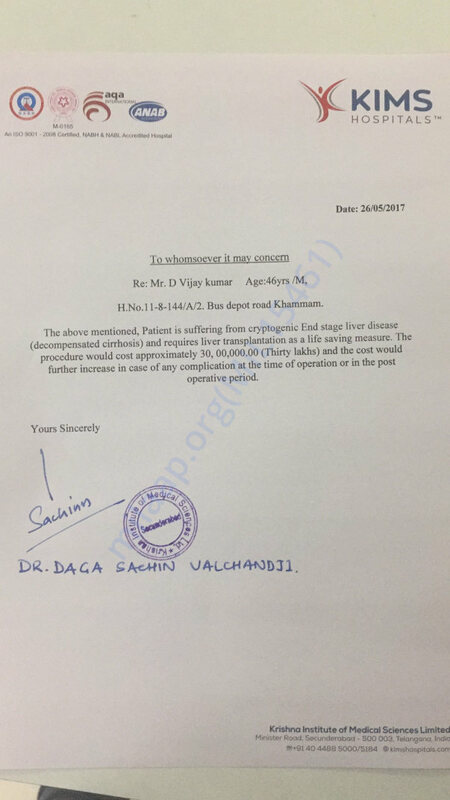 Now he recently got admitted in KIMS and doctors have confirmed his excessive damage of the Liver is affecting other organs like kidneys and he needs a Liver transplantation immediately which will cost us 30 lakhs that includes pre and post surgery charges. My Brother and me have spent all the saving including the money we have saved for our future and my marriage and we are financially broke, he is just 46 and has to see his kids achieving heights and we really want to save my father and we cannot afford to lose him. Please help us to get my dad back to my life ! 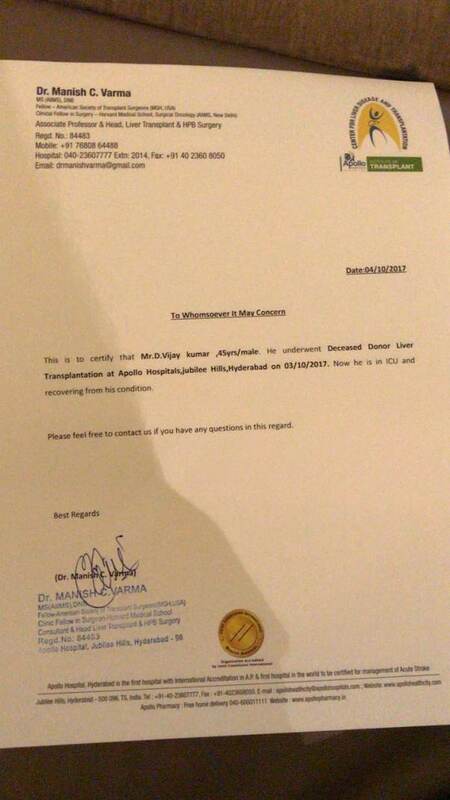 For any queries, Please do not hesitate to contact KIMS Hospital patient name D. Vijay kumar ( 46M). Thank you for your tremendous love and support. It gives me immense pleasure in informing you all that my father is doing very well now. He had a few complications and he developed a minor infection but now, he's okay. He's healthy and is at home now. He might start working in about 4 months' time. This couldn't have been possible without you all. We shall forever be indebted to you. Thank you again! 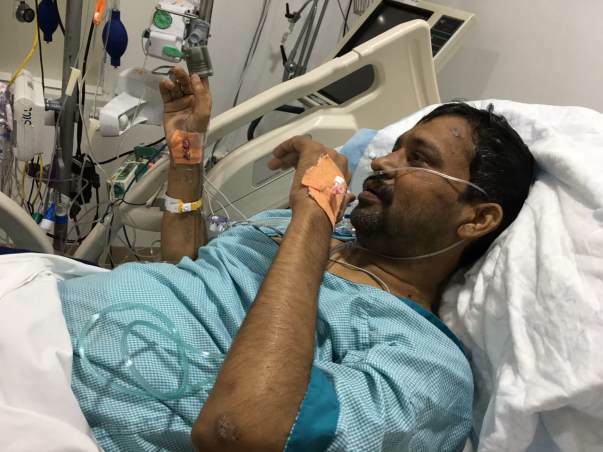 Here is an update on Dvijay. It's been 40 days since the transplant has got completed and my father is doing well for now. He is undergoing medication along with tests twice a week. We are taking care of him in all the possible ways and will continue like this for next 3 months. Thank you all for supporting. Please pray for his speedy recovery. Greetings to all ! It’s been a long since we posted an update but today is the day where I should write up and this is what we are all waiting for. I’ll start with explaining the period that we gone through from past four months.all ! It’s been a long since we posted an update but today is the day where I should write up and this is what we are all waiting for. I’ll start with explaining the period that we gone through from past four months. Giving life to other is the greatest help one can ever do. I’m talking about organ donation. We have been to the hospital multiple times. We have faced many hurdles though we know that we got enough support from you regarding financials, we couldn’t find a donor. We registered him in all south states for Jeevandhan. He was admitted in hospital for 5 to 6 times because of multiple problems. 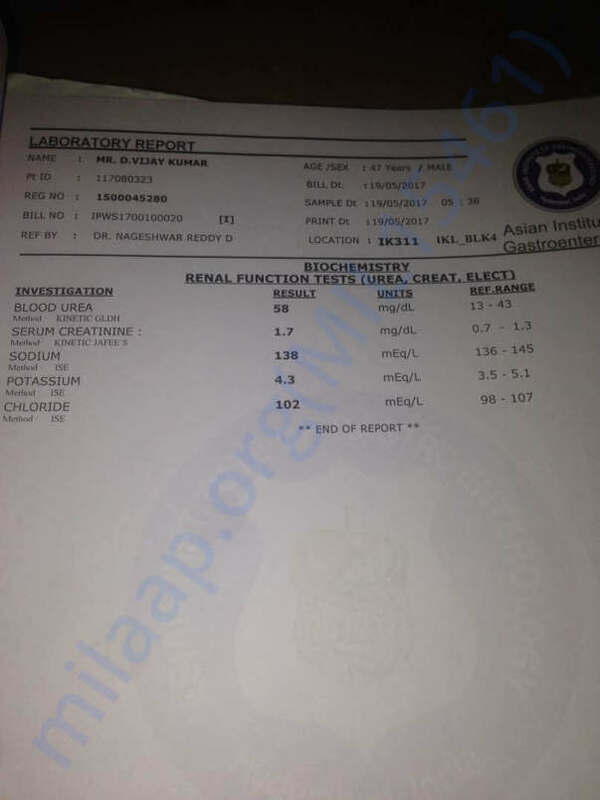 Even from last 20 Days, Dad kidneys has got affected because of his increase in creatine levels and he lost control on himself with different behaviour. 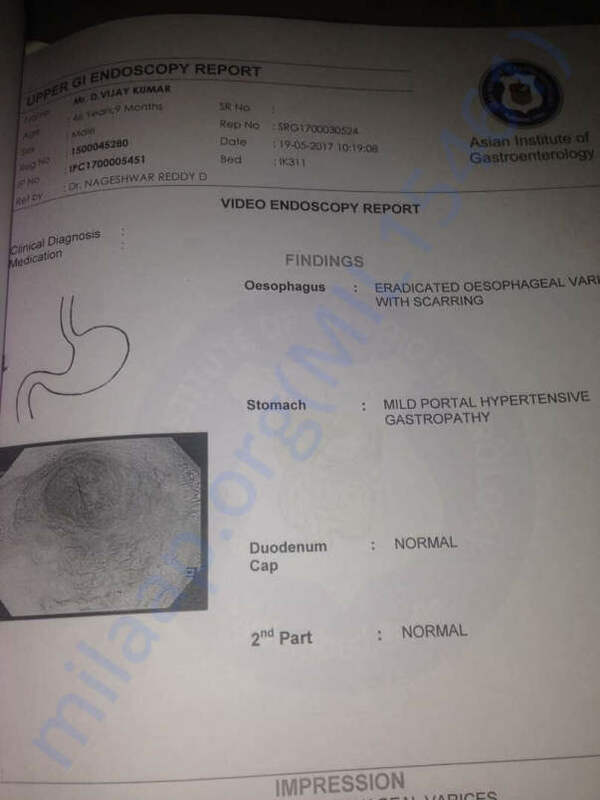 10 days back we admitted him in Apollo hospital and doctors confirmed that his kidneys were also getting infected. It’s very unfortunate that in the past 10 days he was admitted twice to the hospital. He was admitted on 16th Sep and got treated for 4 days and discharged and after 2 days again his levels got increased and he got admitted into ICU and currently, he is in the hospital. He was again admitted to the hospital on 16th Sep and discharged on 30th Sep. We felt very bad because we knew that the only solution for this is getting a donor and going for transplant. Exactly on 2nd October at 8.30pm, we got a call from Apollo saying that there is a donor available and asked us to come with an hour. We had mixed feelings coz they mentioned that they will do surgery only if everything is fine ( blood tests and no infections and lot of medical terms which I couldn’t able to tell ). So we went to the hospital at 10 pm, whole night there were tests that were happened, and till 6 AM in the morning, we were very tense about whether my father would be able to get transplanted or not. 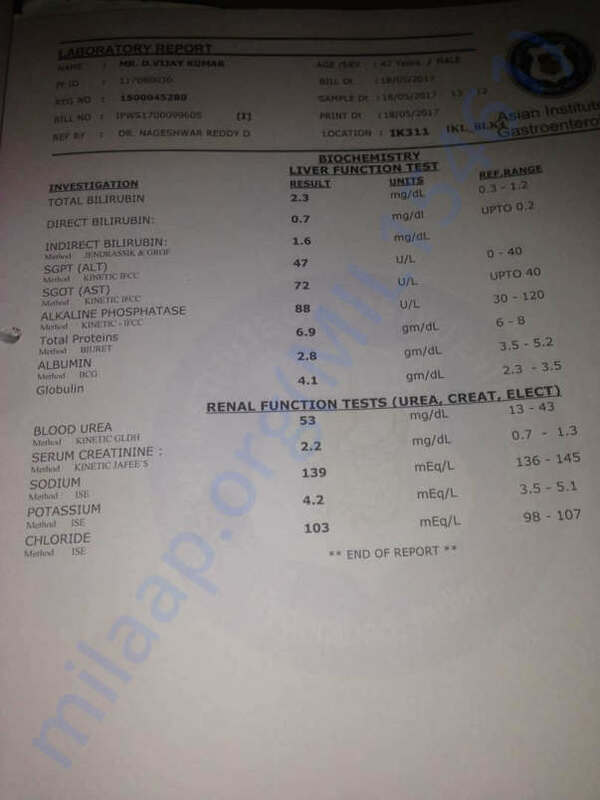 At 7 AM, two people came saying that tests are fine and they are taking him for transplant. Yes, you heard it right, “FINALLY, HE GOT TRANSPLANTED”. The transplant happened on October 3rd from morning 8AM to 5PM and they shifted him to ICU. 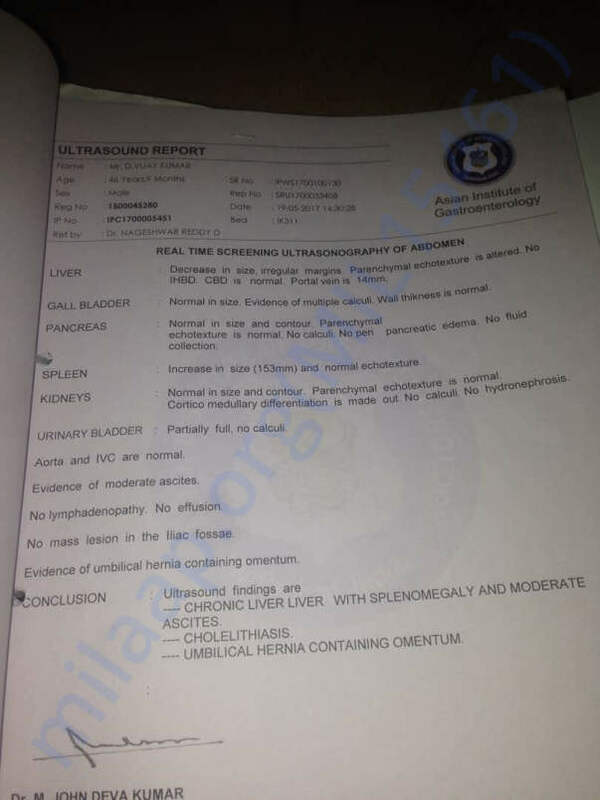 Report after transplant is surgery is successful and they are giving blood to him now and doctors kept him in a very closed room from not being affected any infection. We don’t know how to thank you all for supporting us from the beginning but for us, it was needed to get him transplanted as soon as possible coz of his multiple visits to hospitals with problems on other organs to coz of disfunctioning of liver and now we knew that we have completed the first step of saving his life. Yes, doctors have mentioned this as only first step and how we make sure that he is not getting affected from infection by arranging environment is the second step for the next 3 to 6 months. We will have a tough time for next 3 to 6 months to arrange the things that he need from checkup’s, room, medicine, food everything and its going cost more. We are finding out our ways to get it arranged by 15th October as his discharge might be after 15 days if everything goes well here. If you can help us to recover the expenses post surgery too. It would be of great help. First thing that we have done after struggling for a donor is that me, mom and my sister have arranged to donate our organs after us. Because the donor who donated liver to my father has donated her kidney to one person and pancreas to other person. She is a 17 year old girl who’s in brain dead condition but she saved 3 lives and she can see the happiness of 3 families after her. We are touched by whatever happened from past 3 days and still we are going through that mixed feelings. All I can say is thanks a lot for everything to all of you and we are at 29 lakhs now for the target 32 lakhs. Please share with your friends if you want to help us post surgery for next three months. Thanks to all the supported to stand by us. We are in debt to this world for giving such an amazing people like you. God is kind! You are supportive and I hope my father will see his kid’s achievements. Thank you!